Instead of wearing a RFID badge it’s also possible for a patient to receive a printed wristband with an unique barcode every time the enter the department. When the patient receives the wristband at the reception he/she is already queued in Mosaiq or Aria and the patient can proceed to the designated waiting room. 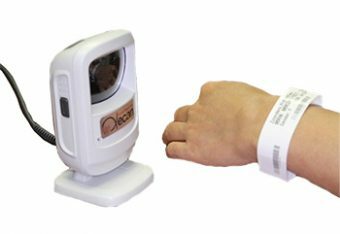 The wristband needs to be scanned when the patient enters either the treatment room or exam room. In the treatment room it will be verified if the patient is the correct one according to the treatment chart that is open. Otherwise an interlock will appear. It’s also possible to use this wristband in combination with biometric identification and/or RFID. For instance: the wristband can be scanned in the treatment room for patient ID and at same time you can use RFID to check if the right accessories are on the treatment couch.